Houston Mayor Sylvester Turner, District E Councilman Dave Martin and Rep. Dan Huberty, along with others, met at B.J.’s Marina, in Huffman to observe the removal of debris from Lake Houston. LAKE HOUSTON – Awareness is growing that this waterway is vital to the over 300,000 people that live near this lake and the metropolitan city it supplies with water. Last Friday, local leaders including the mayor, State Representatives Dan Huberty, John Culbertson and others witnessed the cleaning up of the Lake from Hurricane Harvey, of debris that washed into the lake when it was hit by 51 inches of rain. “Lake capacity was reduced by 30%. If we don’t do this it will get worse. Things will wash into the area, and you are going to see the risk of losing capacity. If there was any need for a reminder, we got one on July 4. So, that’s the reason we have to move, and we have to move very, very quickly.” said Houston Mayor Sylvester Turner. 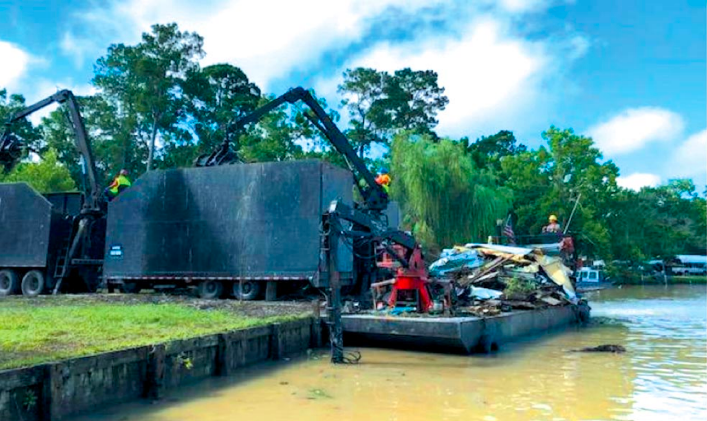 The City of Houston’s Solid Waste Management Department contracted with DRC Emergency Services, LLC, to have several barges freight off over 50,000 cubic yards of debris. Dan Huberty, R, 127th Texas House District, and before redistricting representative for Crosby and Highlands, backed a program called “Plea for Three” months ago that among other things called for Remediation: Full funding to dredge both Lake Houston and the San Jacinto River in order to remove the sand, siltation and debris deposits and stricter enforcement of TCEQ regulations on legal and illegal sand mining operations. And act on conditions resultant from the three major flooding incidents since 2015. This clean-up project started in mid-May and since then, crews have removed 1,000 to 2,000 cubic yards of debris each day. San Jacinto Riverbed scouring image post Hurricane Harvey. Gridded areas of riverbed labeled A, B, C, D will be repaired, as well as exposed toxin area in Northwest corner (dark blue). DALLAS – June 29, 2018 — The EPA is directing the potentially responsible parties of the San Jacinto River Waste Pits Superfund site in Texas to take immediate action to address damage to the protective cap. Initial repairs will begin shortly at the damaged areas where the protective rock was missing. Upon completion, EPA will inspect the final repair. EPA received preliminary data from sediment samples collected by EPA’s dive team from twenty-two small areas measuring up to 50 square feet at the San Jacinto River Waste Pits Superfund site. 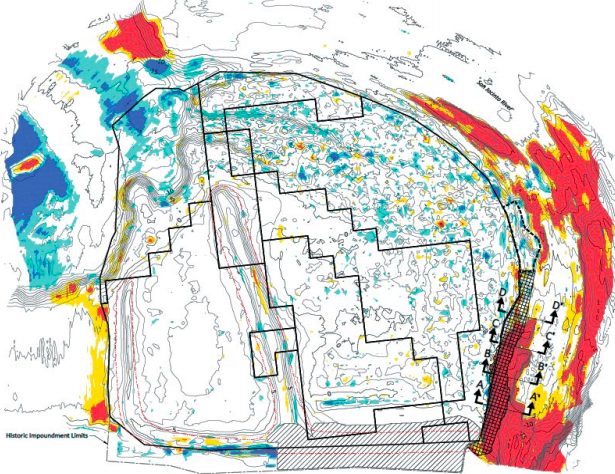 Samples from twenty-two of the areas confirmed the protective cap is absent and the underlying waste material was exposed. The preliminary sample showed dioxins up to 60,500 ng/kg. EPA recommended clean up level for the site is 30 ng/kg. EPA has directed both International Paper and Industrial Maintenance Corporation, the potentially responsible parties (PRPs) for the San Jacinto Waste Pits Superfund site in Harris County, to take steps to ensure that the exposed waste material is isolated and securely covered. The dioxin in the waste material does not dissolve easily in water, but it can migrate further out into the surrounding sediments. The beleaguered head of the Environmental Protection Agency, Scott Pruitt, resigned his position last week, on July 5th, only one day after attending a 4th of July event at the White House. President Trump accepted his resignation, and said that his assistant, Andrew Wheeler, would take over EPA as Acting Administrator. Pruitt had befriended local Houston environmentalists such as Jackie Young of the SJRC, and Scott Jones of the GBF. It remains to be seen whether the new administrator will be as open and helpful on their local issues. 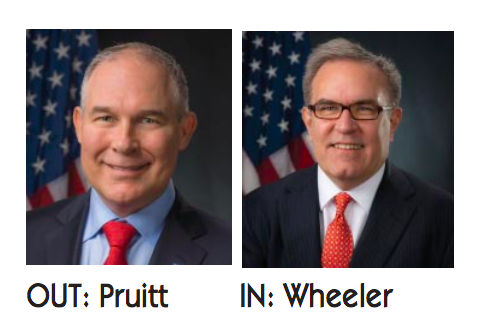 Pruitt had become well-known in Houston environmental circles, having visited the San Jacinto River Waste Pits in person, and placed their disposal on his “Top Ten” list of projects to receive his attention. Pruitt’s tenure at the EPA was controversial from the beginning, and as he made a number of questionable choices in his style of administration, he became a constant source of embarrassment to the President and his administration. He had been questioned by Congressmen and the media about high travel spending, security team costs, dealings with lobbyists who he would have to rule on later, and misuse of government resources. 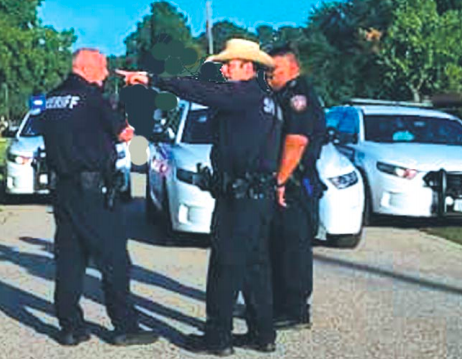 On June 28 at about 6:00 a.m. near FM 2100 at FM 1942, shots rang out from a man that walked up and began firing into a vehicle occupied by a man and a woman. The suspect fled the scene. The man was flown by LifeFlight Helicopter to Memorial Hermann Hospital and the woman was taken by ambulance to a local hospital. No arrests have been made in the incident.